Are you a country music fan? When I first met my husband Troy, I did not like country music at all. He made me a country CD to listen to with some of his favorite songs on it and I never looked back. I now love country music and it is about 70% of what I listen to. I am also a fan of Miranda Lambert. Her song "Gunpowder and Lead" is one of my favorites. Miranda Lambert recently paired up with CRYSTAL LIGHT for their Platinum Points program. This program helps to reward CRYSTAL LIGHT purchasers with Miranda Lambert gear. As a country music fan, this sounds awesome! This program coincides with Miranda's Platinum tour that she is on now presented by CRYSTAL LIGHT. To use this program and earn points, you just have to purchase CRYSTAL LIGHT products from Walmart, take a picture of your receipt with your smartphone and choose from a variety of rewards. To sign up for the CRYSTAL LIGHT and Miranda Lambert Platinum Points program, just click the link, enter your email address or Facebook information, purchase the Crystal Light products, and then visit www.earnplatinumpoints.com on your phone and take a picture. It is not too hard to do for earning some fun prizes, especially if you already drink CRYSTAL LIGHT. To get started, you can use the code mirandaic for 30 free points for signing up. Also by referring friends, you will earn 10 points for each friend that signs up. Gear that you can earn includes an exclusive song download, t-shirts and mugs. I would love one of the mugs! To try out this program, I headed to Walmart to purchase some CRYSTAL LIGHT. I chose the lemon iced tea to try out since my husband often likes to drink iced tea for dinner. 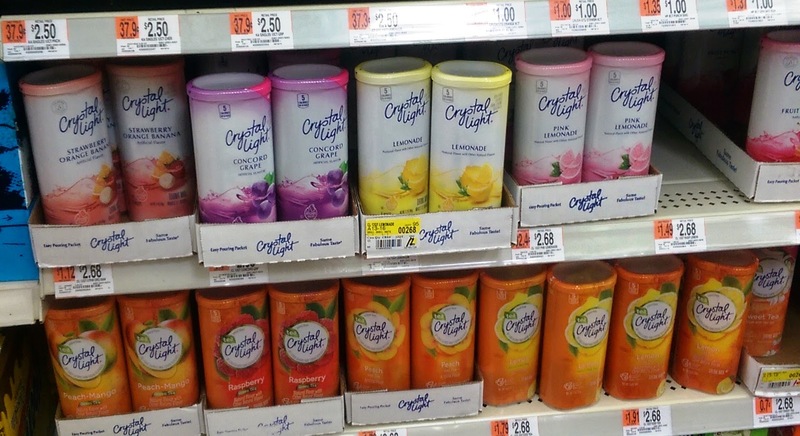 Walmart had a nice selection of CRYSTAL LIGHT products. I also like this brand of lemonade which I have at home. The products are located with the juice and was easy to find. For my experience signing up for this program, it was easy to do and was not hard to scan my receipt in and redeem points. I now have 100 points in my account. I like drinking CRYSTAL LIGHT on occasion for a low-calorie beverage when I do not feel like drinking water. I like that it is offered in many different flavors. I think that it would be a fun mixer for an alcoholic beverage to keep it fairly low-calorie. Miranda Lambert even has her own recipe for a "Randarita" that would be fun to try.